Llucmajor is an agricultural and industrial city in the south of the island of Mallorca, the city, which has about 13,000 inhabitants, is the capital of the largest municipality in Mallorca and the Balearic Islands, with 327 km² in area, the common has 36000 inhabitants and is part of the County of Mid-day (Comarca de Migjorn). Llucmajor benefits relatively few tourist activity, as the coast of the town is largely made ​​up of cliffs (acantilats), which give way to a few resorts : S’Arenal and Cala Blava (Blue Creek) to west and Cala Pi (the Pine Creek) and S’Estanyol de Migjorn east. 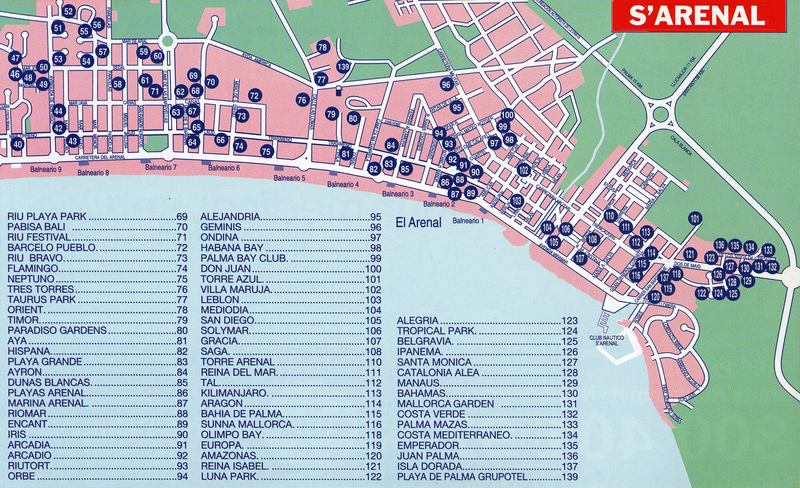 However, the S’Arenal Beach is very popular because of its proximity to the capital, Palma. The origin of the town of Llucmajor is an ancient Moorish farm (alqueria) that was part of "juz" Muslim Montuïri. Two etymologies are generally proposed for the toponym "llucmajor" as the first word come from a Mozarabic word derived from the Latin accusative "lucum majorem" the largest grove, the presence of massif of Randa at north of the city, could explain. For the Romans, "Lucus" meant a sacred wood, the name of the monastery of Lluc in the Serra de Tramuntana, has the same origin. The second etymology - from the local pronunciation of the name of the city, "llummajor", where "c" is bound with the "m" that follows - is the origin of the word in the phrase "llum major", the "great light". 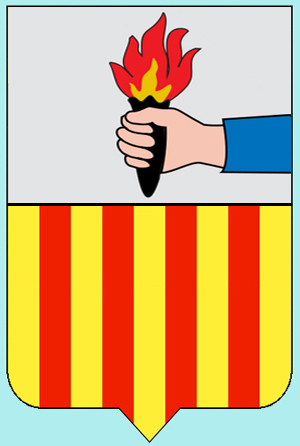 The crest of the city adopted this etymology, and shows a flaming torch held by an arm, but this etymology is wrong. In Castilian Spanish, Llucmajor is written Lluchmayor. 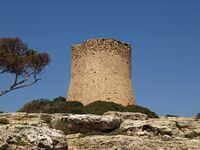 The municipality of Llucmajor occupies a plateau - covered with windmills - which lies at the foot of the massif of Randa (4 km north-northeast of the city) and ending with coastal cliffs, a height of over 100 m on the south coast of the island of Majorca. To the east the plateau is bordered by the plains of Campos and Colónia de Sant Jordi. The highest altitude plateau Llucmajor is 151 m. On the edge of the plateau streams form gullies, with limestone riprap often flush with the soil surface, as in Cala Pi or whose benefit the port S’Arenal. The coast extends from Llucmajor and Cala Blava S’Arenal west, in the eastern sector of the Bay of Palma, to S’Estanyol de Migjorn (the "Pond of the South") is the, through the Cap Blanc, the Punta de Capocorb and Punta Plana. 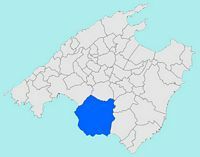 The municipality of Llucmajor borders the towns of Palma, the capital of the island, to the west of Algaida north of Montuïri north of Porreres northeast and Campos east. 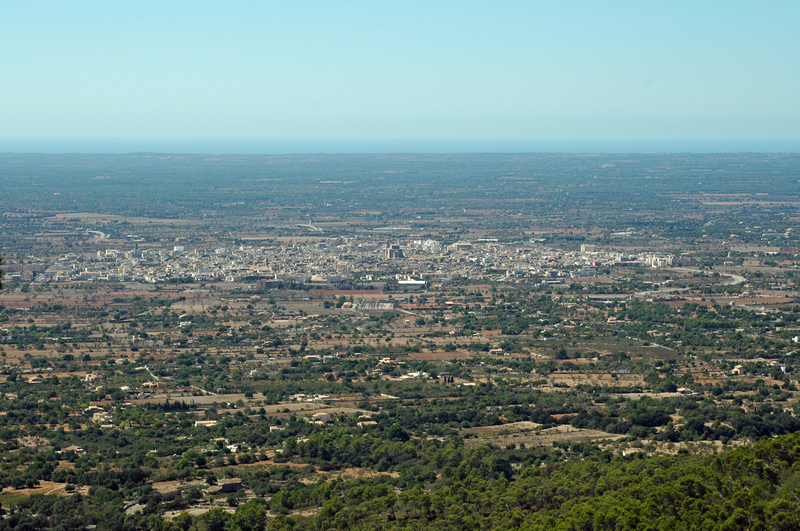 The town of Llucmajor is located 20 km southeast of Palma and 15 km from Palma airport, Son Sant Joan, the town is 15 km from the coast and therefore is not subject to tourist invasion. From Palma Llucmajor is reached by motorway Ma-19, which continues eastward to Campos and Santanyí. 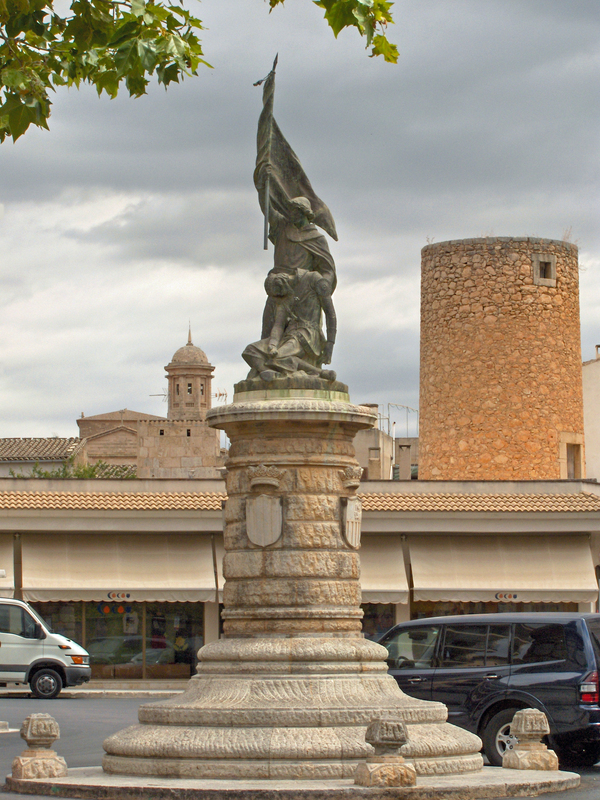 Coming from Palma it reaches the center of the Llucmajor Passeig de Jaume III (Course James III), which is an imposing monument in honor of King Jaume III of Majorca who died at the Battle of Llucmajor. Jaume III was fighting for the possession of Majorca, with his brother and lord King Peter IV of Aragon (Pedro IV de Aragon), said Peter the Ceremonious. The Battle of Llucmajor took place on October 25, 1349, in the plain of Galdent north-east of the city (follow the street Carrer de Galdent to the edge of town). Jaume III died in the battle, he was the last king of Majorca island lost its independence and was annexed to the Kingdom of Aragon, the son and daughter of Jaume III were taken captive in Barcelona, ​​his son, Jaume IV, continued to claim the Kingdom of Majorca, but without success. Jaume III was first buried in the parish church of Llucmajor, then his body was transferred to the Trinity Chapel of the Cathedral of Palma. 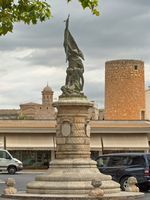 On Placeta del Sabater, near the Carrer Bisbe Taixequet, you can see another monument, this one in honor of cobblers Llucmajor. In the twentieth century footwear industry experienced a great development in Llucmajor, until the 1970s, the industry employed the majority of the population; Llucmajor continues to produce quality footwear. 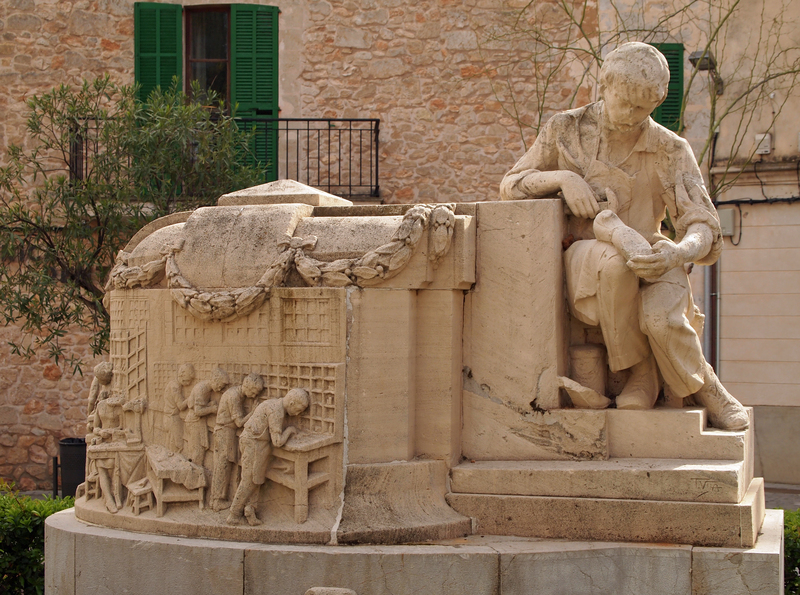 The Cobbler is a statue of the sculptor Tomás Vila, made ​​in 1963 in sandstone Santanyí. Llucmajor is a typical village of the Majorcan countryside, with low houses shuttered, long straight streets and shaded place comes alive on market days. The city has quite a few cultural attractions, the Passeig de Jaume III, continued the Bishop Taixequet street leads to the historic center of the city where the parish church of St. Michael. In 1300, King Jaume II granted the status of "villa" (town) Llucmajor, the urbanization of the city developed in the fourteenth century in the quadrangle "Quadrat" bounded by: Carrer Jaume II, Carrer del Convent, Carrer Vall and Carrer Major. A few hundred meters east of the St. Michael’s Church, just outside the "Quadrat" is the old Franciscan Monastery of St. Bonaventure. The first church was built in Llucmajor from 1259, thirty years after the Catalan conquest of Mallorca. In 1386 a new church in the Gothic style, was built on the site of the present church St. Michael, the preacher Vicent Ferrer (1350-1419) - the future St. Vincent Ferrer - came to preach. This is the eighteenth century, in 1784, began the construction of the church of St. Michael, after demolition of the church of the fourteenth century this building lasted until the late nineteenth century. Various contractors and architects intervened in this construction: A. Mesquida and Brother Miquel de Petra in the eighteenth century, and Isidro González Velázquez and architect Joan Sureda the nineteenth century. The church of St. Michael is the most iconic building Llucmajor: it can be seen from a great distance from any access roads to the city. 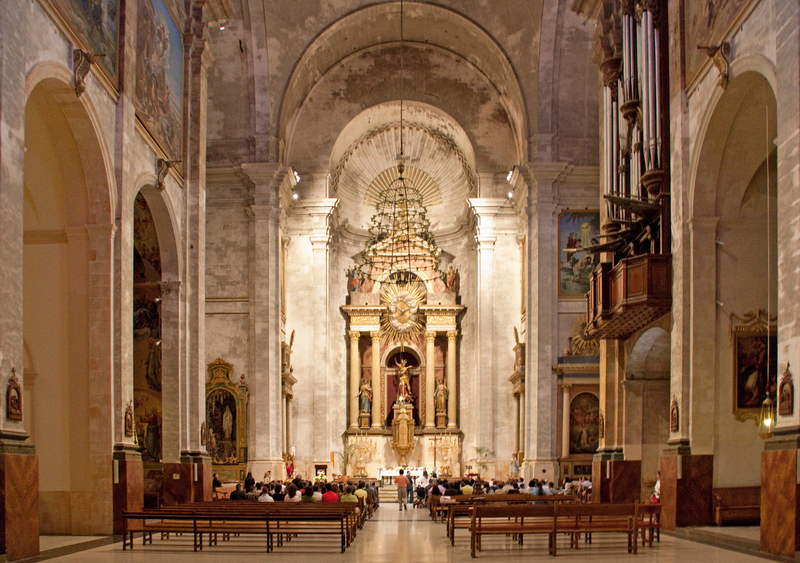 It is the largest church in Majorca, after Palma Cathedral, its dimensions were the cause of many problems during construction. Next to the church is the presbytery (Casa Rectoral), the building is typical of houses built on the island in the eighteenth century, it has a coat of arms on the balcony and a sundial on the facade. The parish church of St. Michael is located in the city center, Plaça de Santa Catalina Tomas, west of Plaça d’Espanya. The Monastery of St. Bonaventure was the penultimate Franciscan monastery built in Mallorca. Llucmajor reached in 1599, founding the Franciscan monks began building the monastery in 1608, and the construction of the church spread throughout the seventeenth century. The monastic enclosure includes the church, the cloister, the monks quarters, small outbuildings and a garden. Neighborhoods include fifteen monks cells, workshops, a refectory, a kitchen, a library and a chapter house, and they were completed between 1690 and 1697. The church of baroque style, was completed in 1656 and it was consecrated on 29 October 1656 by the brother Pere Noguera i Roig. The church houses murals, a permanent Christmas crib, with Baroque figures of the early eighteenth century. The chapels of the church is richly decorated: the St. Roch (Capella de Sant Roc) is decorated with paintings by the family of Majorcan artists, Oms, the central picture was painted by the Old Gaspar Oms. The chapel also holds a statue of the Virgin of the Immaculate Conception, which was probably brought by the Franciscans who founded the monastery. Beautiful Majorcan earthenware eighteenth century adorn the chapel of Our Lady of the Angels (Capella de la Mare de Déu dels Angels). In the same chapel is a Virgin of the Immaculate Conception by the artist’s most important Majorcan Baroque Francisco de Herrera. 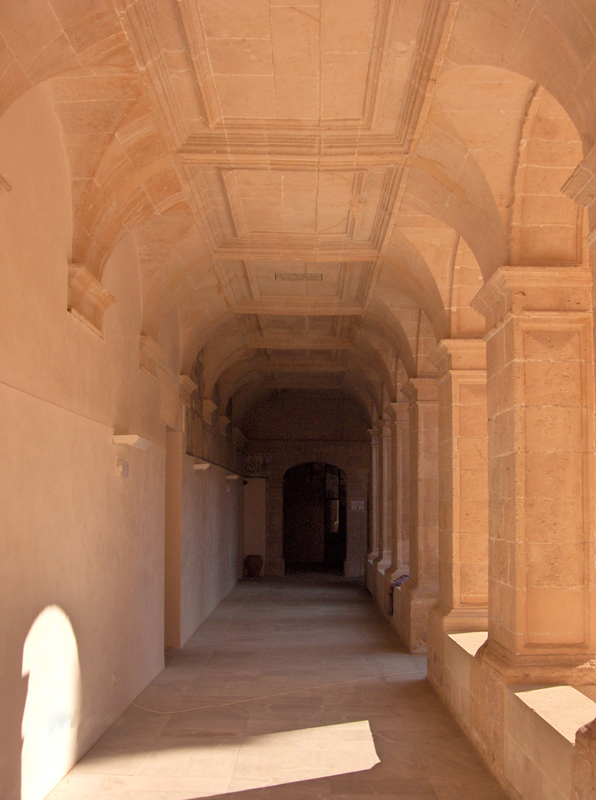 The cloister of the Franciscan Baroque: a square plan, is surrounded by a double gallery sandstone, the rectangular columns and segmental arches in cart handles. The lower gallery is covered by vaults gallery floor is covered by a beamed ceiling. The roofs are covered with clay tiles painted with red ocher (iron oxide), the paintings depict biblical texts, poetic and profane. In neighborhoods monks corridors on the ground floor are decorated with monochrome murals painted by the painting technique of grisaille (shades of gray). These murals depict saints and blessed Franciscans, easily identified by a strip-shaped cartridge. These paintings were made ​​in the late seventeenth or early eighteenth century, that is to say, shortly after the end of the construction of the monastery in 1697. The Monastery of St. Bonaventure is the only one in Spain and one of the few in Europe where such paintings are kept in good condition. The northeast corridor has effigies of St. Peter of Alcantara, St. Frances of Rome, of Blessed Salvador de Horta, St. Margaret of Cortona and St. Louis of France, King of France. The corridor northwest houses representations of Blessed Raymond Lull, closely linked to the Majorcan Franciscan Order of St. Bridget of Sweden Patron, St. Roch, St. Colette and St. Dominic de Guzman. The corridor southwest begins with the image - Fatal - St. Francis of Assisi, founder of the Order, and continues with images of St. Clare of Assisi, St. Bonaventure, holder of the monastery and the General Franciscan Order, St. Isabella of Portugal, queen of Portugal, Saint Anthony of Padua, Saint Isabelle of Hungary and St. Bernardine of Siena. Finally, in the southeast corridor is retained only three paintings: St. Clare of Montefalco, St. Louis Bishop of Toulouse and St. Joan of the Cross. The Monastery of St. Bonaventure was served by the Franciscan Order to the confiscation of church property by the anticlerical government Freemason Mendizábal, a worshiper of Mammon, which took place March 10, 1836. Until 1998, the monastery was occupied by the Civil Guard. In 1999, the monastery was restored and now houses a cultural center opened in 2007. The murals, bleached repeatedly after the confiscation, were discovered in 1999 by a group of historians from the University of the Balearic Islands. At the end of the fifteenth century a plague struck Llucmajor and the population invoked Our Lady of Grace and thank him built a chapel on the Puig de Randa, Llucmajor above. In 1501, a sculpture in the image of Our Lady was created by the sculptor Gabriel Mójer and is kept in the chapel. In the seventeenth century a new chapel was built. Go to the Shrine of Our Lady of Grace. S’Arenal the largest resort in the municipality of Llucmajor and its permanent population is almost as important as the capital of the municipality. S’Arenal located on the eastern coast of the Bay of Palma. A little to the east S’Arenal, Cala Blava has a small beach surrounded by cliffs. Since the coastal road S’Arenal manages to Cala Blava and Badia Blava and Badia Gran before reaching Cap Blanc. 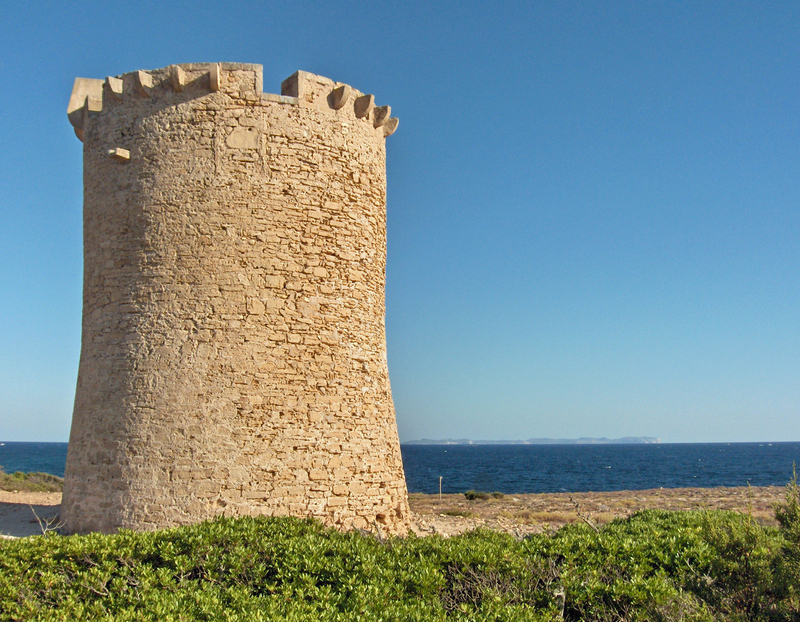 Cap Blanc offers a wide panorama of the sea and is topped by a tower dating from 1579 and a lighthouse. At Cap Blanc coastal road deviates from the coast and headed inland towards the village of Capocorb. 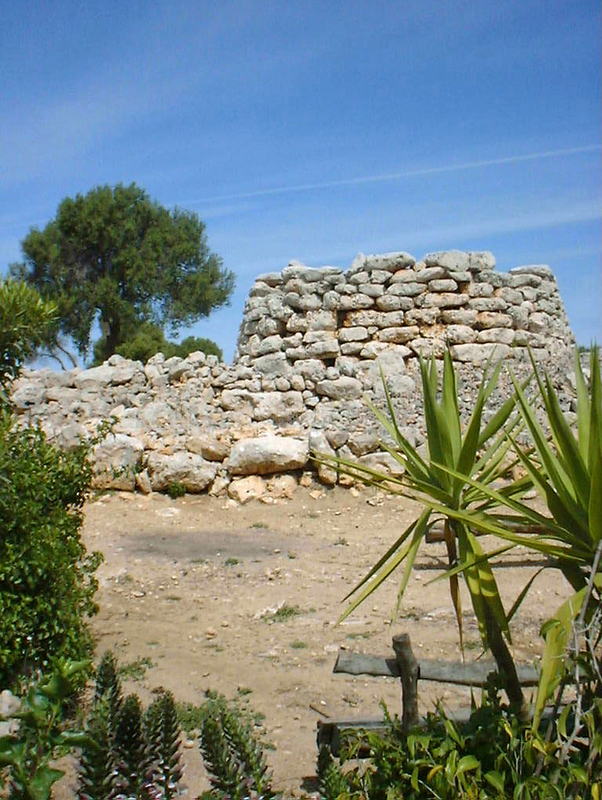 After 6 km you reach Capocorb where the talayotic Capocorp Vell village, dating back to prehistoric times. Talayotic The village is located 13 km south of Llucmajor, it is often said in Spanish as "Capicorp Vey". It contains many relics dating from about 1000 BC. 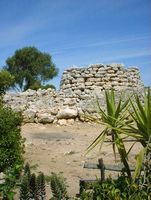 Surrounded by arid scrubland, this prehistoric village incorporates the ruins of talayots 5 and 28 units, and a burial chamber access a bit difficult. A paved trail winds around the remains, but it is quite difficult to get an idea of ​​how the town was organized. The most impressive features are the Cyclopean walls, which reach a height of four meters in some places. Address: Carretera Arenal - Cap Blanc, 23 km. Hours: Monday to Sunday, 10:00 to 17:00, closed on Thursdays. After the village of Capocorb, the road back to the coast to Cala Pi, a distance of 4 km. The cove of Cala Pi hides a beautiful sandy beach, quite small (50 m wide), wedged between high cliffs overgrown with pine trees and lined with ramshackle fishing huts, you can access the beach via a steep staircase. The cove is deep and well sheltered from the wind, with clear waters and as calm as a lake, ideal for children. The village is quite isolated and far from everything, but it has a quality urbanization and a pretty good fish restaurant on Restaurant Miquel. 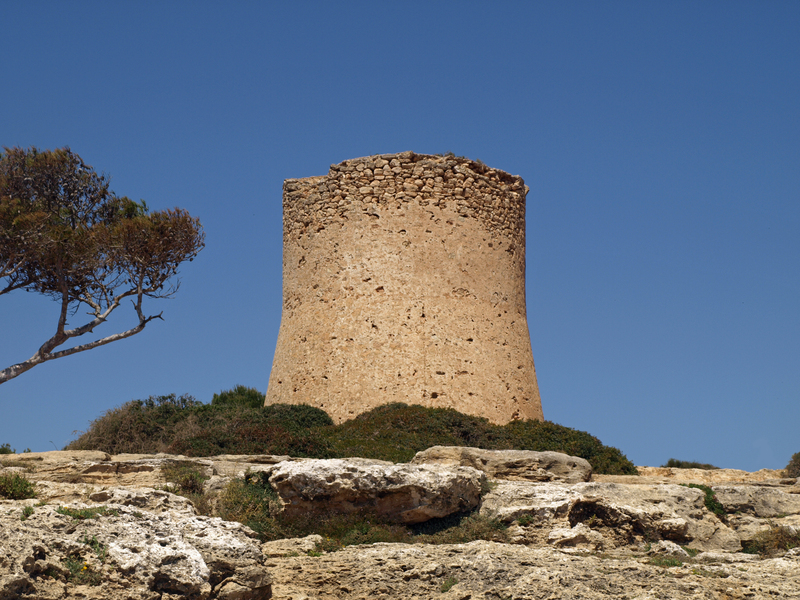 The cove is dominated by a watchtower dating from 1663, which offers beautiful views of the cliffs. The small resort of S’Estanyol de Migjorn (the "Pond of the South") is the border of the territory of the municipality of Llucmajor, between the tip of Punta Plana and the resort of Sa Ràpita belonging to Campos. 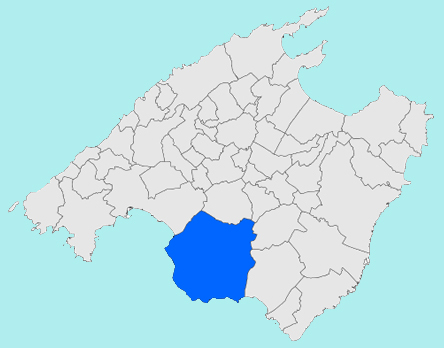 S’Estanyol de Migjorn is 18 km south of Llucmajor, the station has grown upon subdivision of an old "possessió" the area of Son Fideu; wealthy inhabitants of Llucmajor then built houses Summer S’Estanyol. In the early twentieth century, there were nine huts where fishermen. 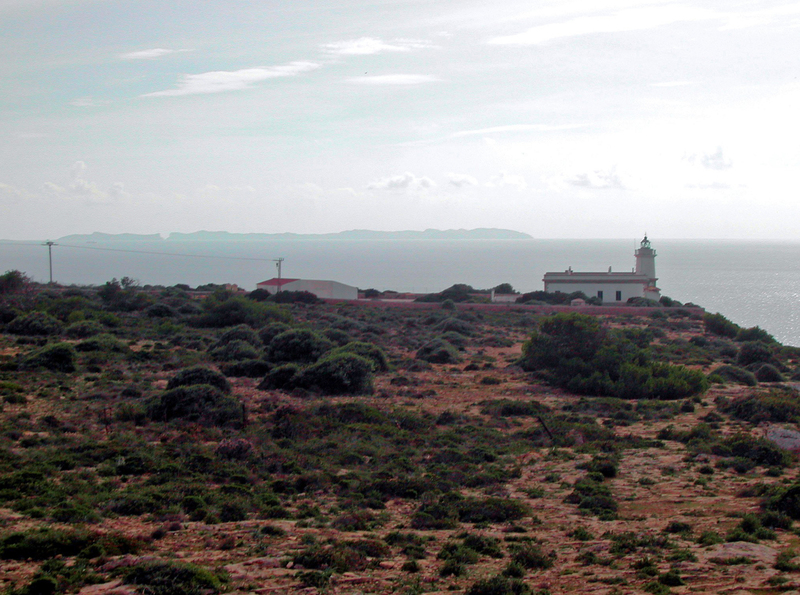 The station is located at the mouth of a seasonal stream, the Torrent de Garonda, who dug his ravine along the Punta Plana, the creek can not easily flow to the sea because of coastal dunes. This forms a wetland aquatic vegetation which is the origin of the name of the locality, the "Pond of the Mid-day". The resort has a limited tourist infrastructure, with a rocky beach and most importantly, a beautiful marina from 1970, the Yacht Club S’Estanyol. 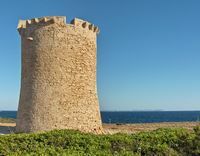 On the "possessió de s’Estelella" is a tower, Torre de s’Estelella, which dates from 1577. It offers a beautiful view of the southern tip of Mallorca, on the island of Cabrera and Colónia de Sant Jordi, on the opposite side of the bay of Sa Rapita.